The Otago Daily Times–locally known as the ODT–is a good newspaper, I wouldn’t be buying it otherwise, but even good papers mess up from time to time. Why on earth has the ODT presented an homeopath in one of it’s on-going series of snapshots of people in different careers? More importantly, perhaps, why does the presentation have no critical questioning? John S. Carroll recently said that journalists’–and by implication, newspapers’–loyalty should be to citizens. To me, this includes critically judging what they present. Things that appear in print gain a certain amount of creditability merely by being in print in a reputable publication. Shouldn’t statements of questionable creditability be questioned in order that the citizen is well served? 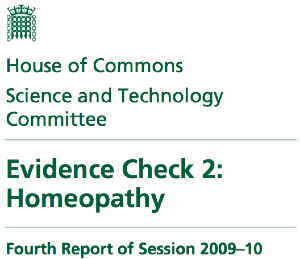 Should a journalist not question the creditability of homeopathy in questioning a homeopath? Should this even be offered as a sound career option on a careers page? My answers: yes to the first, no to the second. There’s enough trouble trying to get rid of this nonsense without it being presented as something someone might aspire to. I’ve previously outlined why homeopathy is nonsense. I’d encourage readers to read that article, and the links within it, but in a nutshell the main thing is that homeopathic remedies contain noneof the proposed active ingredient in them. Nothing, nada, nil, कुछ भी नहीं है, нищо¸没有, ništa, nijedan, nic, intet, geen,ום דבר, niente, 何も, nimic, 아무것도, zilch. Homeopathic remedies do not contain any active ingredient. The original preparation has some substance that is removed by an elaborate series of dilutions. In the resulting remedy, the substance that was in the original solution has been completely diluted out of it. It’s quite a ruse. The labels name the substance and the dilutions used, but does not state how much is in the actual remedy being sold… there none of the active ingredient in the remedy sold. This makes the labelling misleading to those who don’t understand what has been done. Homeopathic remedies have no means to be more than a placebo. But back to that question-and-answer in the ODT. Let’s look at some of what was said. Unfortunately the article isn’t on-line as far I am able to tell, so I’ll excerpt what I can and we’ll work from that. This is going to be long-winded, the sort of thing you might expect from Orac. No apologies for that: you’ve been warned! 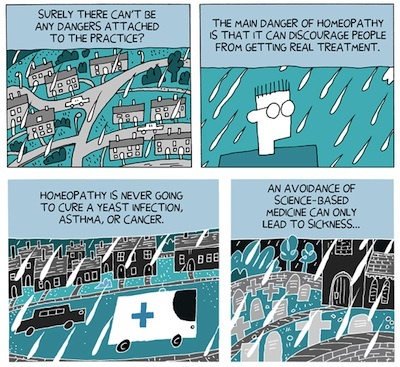 People really need to understand the extent homeopathy is a sham. It’s utter bunkum. Homeopathy is an industry in NZ complete with schools and businesses. That doesn’t make it right. The madness of giving these remedies–and businesses that offer them–creditability has to end. As an example, in an appalling move, Rural Women NZ awarded last year’s supreme winner of the Rural Women New Zealand Enterprising Rural Women Award to Homeopathic Farm Support Ltd. RWNZ have lost all creditability in my eyes for doing this. No-one should be giving industry awards to homeopaths. This isn’t particular to homeopathy, it’s true for any business. Whatever the law might say–that’s not what I’m arguing here–it’s immoral to your clients to abuse these. Any homeopath presenting their remedies as having an effect beyond placebo is outside of good business ethics, never mind medical ones. But then, I guess, homeopathic practitioners are too much in the sway of homeopathy’s marketing line to see that. Let’s look at what was actually said. A number of the arguments offered fall for familiar traps. Some are even arguments I’ve seen presented in almost identical fashion by other homeopathy proponents. The interviewee says she was previously a nurse. There are plenty of example of people with very high levels of education who have, shall we say, diverged from the path of good sense. Hell, there are Nobel laureates who have gone on to say some damn silly things. What matters is if the practice offered is supported by evidence, not what the person previous did. You can’t rest on past laurels, as it were. She writes ‘I realised that hospitals are, in effect, ‘the ambulance at the bottom of the cliff’.’ Perhaps, but it’s a false comparison as she has used it, one I’ve seen from other homeopaths. The implication is that homeopaths vie with hospitals. Not true. Their equivalent would be general practitioners, not hospitals. Some people certainly are, in her words, ‘walking to the edge of that cliff’ but things that might make a difference include diet, not smoking, taking it easy on the alcohol, sound preventative medicine–which mainstream medicine does offer, contrary to what she implies–but not homeopathy, unless a placebo effect is helpful. (And if that’s the case, you don’t have to offer it via homeopathy.) Certainly her description is highly dramatic for what she says she treats, according to her, the likes of: sore throats, chronic colds, emotional issues, ’lack of concentration’, ’low mood’ and toddler tantrums. There are several points to note here but to name just one the validity of a practice lies with the evidence for the practice, not who does it. The issues of where homeopathy sits in the medical establishment are complex, vary from country to country, and can be simply bureaucratic, rather than anything to do with the treatment being considered sound practice. She describes her ‘lightbulb moment’ as a German paediatrician saying that in-depth diagnosis was required before offering a particular homeopathic remedy. Frankly, this is silly. It wouldn’t matter which homeopathic remedy you offered; they’re all the same in having none the proposed active substance and being placebos. Silly, this: ‘I began using a few homeopathic remedies. I was astonished at their effect.’ Ignoring the blatantly advertorial nature of this statement, and that it’s anecdotal (her individual experiences cannot show if a product works or not), it misses the key point of these ‘remedies’. They’re placebos. The interviewee writes that the most challenging aspect of her work is practising ‘a system of medicine that has greater acceptance in Europe than New Zealand.’ Homeopathy is not a ‘system of medicine’ (note my emphasis; more on this in following paragraphs). In any event, popularity does not mean effectivity or sensibility, as I have previously written. I’ve previously written (two links!) pointing out that, as best as I understand, homeopathic remedies are considered not to be medicines by the MedSafe regulations. Homeopathic remedies can be sold outside of the requirements of the medicines legislature if they do not make a claim to a therapeutic effect or indications for use. If they choose to make a claim or advertisement of therapeutic purpose the remedy then falls under the full medicine legislature. If homeopathic remedies are evidenced as placebo effect only, it seems to me that homeopaths cannot legally claim that their remedies are medicines in NZ. I’d like to think that here a more knowledgeable (and cautious) editor might insist the implications that homeopathic remedies are medicines be removed. I’m of the opinion that the public don’t understand this difference of a remedy and a medicine, at least not properly. 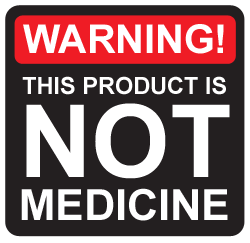 You might consider 1023’s proposed ‘WARNING: This product is not medicine’ label shown above might be clearer! Asked to offer something that most people don’t know about her job, she replies ‘According to the World Health Organisation, homeopathy is the second-most-used system of medicine in the world.’ This brings up the same errors I have just noted, but I’d add this is hardly something to crow about. Leaving aside that this statistic might simply reflect that the most populous countries are lagging behind in medicine, it’s appalling that a historic quackery should persist like this. Aside from the links to other articles I’ve written provided below, the 1023 website is worth reading. There’s also a video on the placebo effect. I’d like greater public awareness… that homeopathy is bunk. Don’t think that I oppose all ‘natural’ remedies. I oppose people presenting remedies that lack evidential support as if they have evidential backing. *  I’m not saying sound financially or not; I’m saying it’s not sound as in ‘not offering a sound product’. Foreign translations include Hindi, Bulgarian, Chinese, Croatian, Czech, Danish, Hebrew, Italian, Japanese, Romanian, Spanish and Korean. Yes, I’m gone completely over the top. Translations courtesy of HowToSayin? Or perhaps fortunately: it not being online limits the damage it might cause a little. Sue Fitzgibbon. I’ve not given her name in the article to emphasis my point that I’m not really interested in particular people, but homeopathy as a whole. And what on earth is Fonterra doing accepting this business as a sponsor of their Fonterra Organic Conference? Likewise for the Dairy3 Women in Dairying conferences. Conferences should always take care over who they use as sponsors, as their own creditability goes with their decisions. Admittedly, usually in their later years. I’m not a lawyer, but this is my reading of things from previously looking at the MedSafe legislation. David is a local. (A least while he’s studying here!) To make it painfully obvious to those from overseas, spoken aloud it’s pronounced by spelling the letters O-D-T.
I’m sure you teach them well Alison! Youâ€™d wish that homeopathy was just generally recognised as bunk, though, without the need for the likes of us to point it out after the fact. While also slightly off-topic, I mentioned the issue of labelling homeopathic remedies in my article. This post from Ben Goldacre has readers contributing labels for a homeopathic remedy. While most attempts are just humorous, there is a serious issue underlying it: how do you convey well to the uninformed potential customer what the bottle really contains and it’s limitations in a few words (without being over-the-top about it). How can the ODT present homeopathy as a serious career choice? I presume that the item wasnâ€™t an obscure expression of journalistic humour? A couple of years ago I had no opinion on homeopathy. I had not done any reading about it and had not encountered anybody who had used it. I had no knowledge on which to base an opinion. To learn more about it I took a university paper, which meant that I did heaps of literature searches, went back to original sources, read current research and Cochrane meta-analyses. Net result: the most charitable thing I can say about homeopathy is that it is a highly elaborate way of administering a placebo. Homeopathy has a scientific basis that is about as valid as fantasies about the present-day activities of the ancient Greek pantheon. I presume that the item wasnâ€™t an obscure expression of journalistic humour? GENX 828: Complementary Medicine – Its Place in Primary Care. It’s an Otago paper. The paper tends toward the woo side of things, but I have a very strong background in science and couldn’t psychologically approach it any way other than by the scientific method. My conclusions about other CAM modalities were similar to my conclusions about homeopathy. Iâ€™ve toyed with trying to sit on that course (or itâ€™s present-day equivalent that Iâ€™ve seen advertised) and write a blog article about (or three), but time gets in the way. If it does err on the woo side, thatâ€™s a worry for a medical course in a university setting. When you write â€˜tendâ€™, how strongly? Yes, I picked up on that too. What is a university medical program doing offering a ‘woo-ish’ paper? And just how woo-ish is it? I sat the paper the first time that it was offered, because I didn’t know anything about CAM at all and wanted to know what it was about. I thought that a structured approach through a University may help me mith my learning. I think that the attitude taken by the paper is dependent upon the students who take the paper. There are only a small number of students and their individual approaches can shape the course. If the students are science based, like myself, then the information provided and the supplemental reading, along with further literature searches, tend to make the course a history of earlier approaches to medicine that have subsequently been shown to be erronious. Or more accurately, useless. If the students are already into the woo then I don’t think that this paper is going to change their approach. It all depends on the viewpoint from which a person approaches the paper. Of note is that the main resource person when I did the course had degrees in both medicine and homeopathy, both from european universities. I suspect that if I tried to study homeopathy as well as medicine then the dichotomy would drive me insane! Hi Grant: Good article. I ‘m working on San Francisco artist Mary Curtis Richardson (1848-1931), an excellent portrait painter and savvy well-grounded woman who was a friend and neighbor on Russian Hill of a Swedenborgian pastor, Joseph Worcester. A key member of his congregation was William Boericke, a wealthy homeopathic doctor. Why did your article have (or Sciblogs editors add) items by said Boericke? 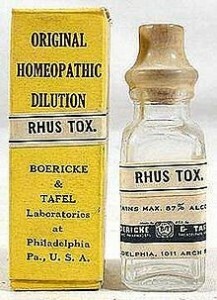 Are they still circulating in the homeopathic community?Would love to learn more.What’s rhus tox, and its genesis? 2 I’ve read that homeopathic ‘doctors’ at that time began by doing a complete case study of the ‘whole’ person, not just his/her symptom. Diagnosis would then be based on this ‘whole-person’ analysis. This seems to put it within a therapeutic tradition, in parallel to the developments of other ‘talking cures’ etc developed at the same time by Freud and Jung. The pharmacopia is subordinated to a therapeutic framework, but like all therapies in the market, it spins money for the ‘doctor’/therapist. Keen to hear from anyone doing research in this area. Why did your article have (or Sciblogs editors add) items by said Boericke? Itâ€™ll have a few details about where the image comes from. Not much of a lead, though. I canâ€™t really help you with the details of if the homeopathic community still uses that remedy, beyond what you could do yourself. Iâ€™ve read that homeopathic â€˜doctorsâ€™ at that time began by doing a complete case study of the â€˜wholeâ€™ person, not just his/her symptom. Iâ€™m not familiar with the history at that level. My interests are a little more present-day and pragmatic, e.g. the persistence these remedies despite that they are basically placebos with a marketing pitch. I imagine, though, youâ€™d want to determine to what extent determine if the â€œwhole body diagnosisâ€ was sincere or â€˜artâ€™, i.e. â€œpart of the showâ€. A point is if by talking with the patient at length they feel as if they are being treated, or at least served, irrespective of if the treatment offered is meaningful or effective and to what extent they distinguished between that and the actual remedy. but like all therapies in the market, it spins money for the â€˜doctorâ€™/therapist. Iâ€™m not sure I understand what your meaning here is. Iâ€™d have thought itâ€™d be more correct to say that In the present day situation, doctors donâ€™t really earn from the remedies themselves (so much), as from the services they provide (diagnosis, etc.) The manufacturers and the associated supply chain are who earn from the remedies themselves. Sorry Iâ€™m not a lot of help. so again these people get prejudice and their precious intellect is have goggles of prejudice,superficial view of things,those who said that homoeopathy is nothing than placebo. from where i am stand and see things,if they want to realize the placebo effect of homoeopathy than just take medicine “lachesis 10m” for 3 days in 4-5 little pills.than see the effect. now i am telling you what happened next , you got horrible dreams of snakes,dead bodies,may further you can’t wear tie for whole life. A most excellent piece of writing Grant. I especially like the warning about it not being medicine. That would make people think twice about buying it. One local pharmacy sells homeopathic products alongside conventional medicines as if they are equivalent. I had to stop shopping there as one of the salespeople, dressed up in a white coat, with a respectable sounding title on her name badge constantly badgered me to buy these products, claiming they are both more effective as well as safer, expressing disapproval if I bought something “conventional”, especially for the kids. I’d have to check how this applies to salespeople as opposed to pharmacists, but I‘d have thought she’d be in breach of their Code of Conduct doing that. One of far too many things I‘d write about is it seem to me that pharmacists are in conflict with their Code of Conduct in selling homeopathic products (at least as pharmaceutical products). I love reading the sense of outrage and general intolerance that homeopathy creates here.. Linking to older articles implying that pharmacists haven’t considered the ethical and/or moral issues around selling homeopathic items alongside conventional treatments does not enhance current discussions. For the curious, it would be easy to ascertain that the pharmacy Code of Ethics has been updated in 2011, and that they also have ” Complementary and alternative medicines – best practice guidance for pharmacists ” produced in March 2012. Both documents are available for review and/or download on the NZ Pharmacy Council website. Please don’t stop the outrage, it’s more entertaining than most of the posts and comments on Sciblogs. I think intolerance and outrage is the appropriate response for those advocating magic water for medicinal use. I also see no substantive differences in the new documents that say pharmacists should sell homeopathy if they deem it profitable, or that they should ignore the copious evidence that it is ineffective. I don’t think ‘general intolerance’ is right for me, but your words, not mine. I think it’s important to note while my ‘outrage’—as such—might seem to be at pharmacies it is more at regulation of pharmacies, and the wider pharmacy industry, and it is not at those who elect to buy the products. Ideally people should know better, of course, but pharmacists have far less excuse on this – they’re professionally obliged to know better. Seeing many pharmacies don’t uphold this, it would suggest this wants to be regulated by the product, not morals, as these morals seem to be being ‘overlooked’ somewhere in the chain that decides what products are sold. (See below re franchises, too.) This may be better placed on the supply of products to pharmacies than the pharmacies themselves – ? Do you mean my list of other articles after the post or do you mean Darcy’s link? For the former, I routinely offer readers related reading on my blog for those that might want more. That’s all it is. You might want to say why this might (supposedly) “not enhance current discussions”. (Bear in mind my post was written over 3 years ago now and that earlier comments are similarly old.) If anything I would suggest (most) pharmacists have always had some awareness of the issues, but have either prefer to duck the question as it were, or—where they support use of these remedies—avoided honest questioning of evidence against them, or are perhaps obliged to carry these remedies under a franchise agreement or similar. On the latter – I am also curious as to if pharmacists genuinely elect to carry these or if carrying these is, in part, encouraged (or obliged) by the franchise they belong to, or similar business arrangements. If you’re meaning to imply these developments after I wrote the post above have resolved these issues, in a word: no. You’re right ‘outrage’ is “entertaining” in a way—and of course that’s why mainstream media play on it, too—but I have to put in a plug in for reading about science itself. Bruce – you might find the perceived outrage entertaining, but the reality is, there is something wrong when people are told that “natural” products are safer and encouraged to buy them. They certainly aren’t told that the products are no better than placebos or that the contents are not subject to regulation. From the Gazetted Ministerial Directive for Callaghan Innovation under “R&D Growth Grants” it states that: “While eligibility requires that applicants submit a R&D plan, the merits of the R&D programme described in the plan will not influence eligibility”. This appears to mean that if a firm wants to research and develop better ways to discover, develop and market new or “better” homeopathic materials, then CI can fund them. Does anyone else find that outrageous? Merit is not important? How did that happen? If pharmacists are considering the moral and ethical issues prior to the sale of homeopathic items as Bruce implies, one can only conclude their moral and ethical standards are fairly low. Pharmacists who own or manage a business are irretrievably compromised when they stock and sell any alternative remedy that has no verifiable record of efficacy. They are driven by a profit imperative to sell an item that has a long and proven record of performance failure at the rate of 100%. They are not alone – physiotherapists are regularly treating patients using acupuncture, a similarly woo-ful remedy. Moreover, last I spoke with a physio friend she advised that courses in acupuncture are acceptable in meeting the ongoing professional development requirements for registration – not sure if this is still the case.